Cop movies are one thing, but what about corrupt cop movies? It’s a sub-genre that seems to pop up more and more in recent years with movies like Training Day, The Departed and countless others. The world these movies live in? That murky underworld where crime reigns supreme and the police are so often just along for the ride. 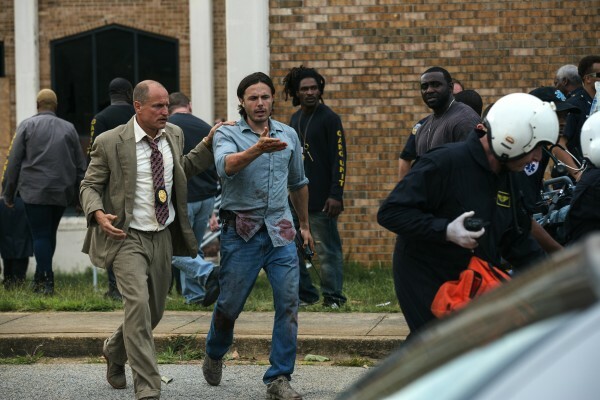 Such a movie is director John Hillcoat’s latest “Triple 9”. Working for the Russian Mafia, criminals Michael Atwood (Chiwetel Ejiofor) and Russell Welch (Norman Reedus), along with Russell’s brother, Gabe (Aaron Paul), and two crooked Atlanta police officers, Marcus Belmont (Anthony Mackie) and Franco Rodriguez (Clifton Collins, Jr.) pull off a successful bank robbery, heisting a safe deposit box. Their boss? Irina (Kate Winslet), the wife of an imprisoned Mafioso trying to get her husband out of a Russian jail. The heist is only part of her plan. She needs Michael and his crew to pull off another job, this time at a heavily-guarded Department of Homeland security facility. How can they buy a window to get in, find the item and get out? Kill a cop, in fact Marcus’ new, inexperienced partner, Chris (Casey Affleck). The call on the radio for an officer shot will bring every cop in Atlanta down on the scene…and potentially give the crew their time. Will it work? When the first trailer for this crime thriller from Hillcoat (“The Road”, “Lawless” and “The Proposition”) dropped, I was sold. 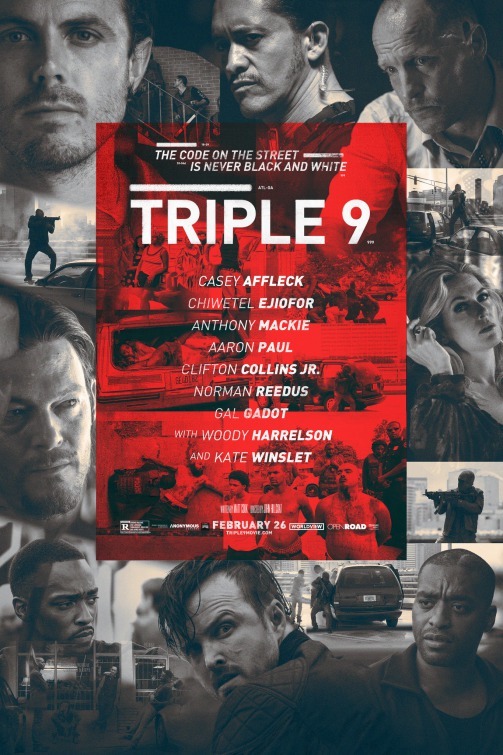 “Triple 9” featured a ridiculously-loaded cast, looked to be dripping with style, and a story built around corrupt cops, cutthroat crooks, the Russian mafia, and a potentially impossible heist? YES. I was on-board. Then, it bombed pretty nicely in theaters and quietly slipped onto DVD/Blu-ray release. Why exactly? Well, for starters, I’m a sucker for movies like this. I liked it a lot – as much as you’re supposed to enjoy a movie this dark – but it’s easy to admit there are some major flaws. 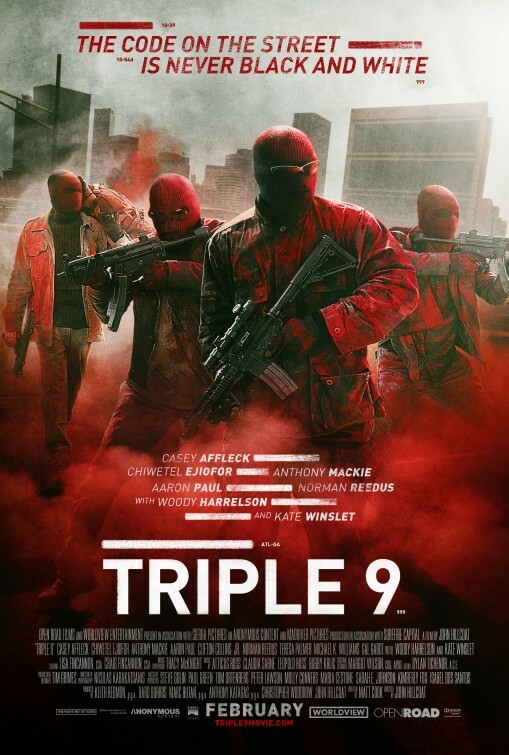 It clocks in at just under two hours, but “Triple 9” probably should have been longer or edited differently. Something. It’s two hours, but so much goes unanswered. How did this happen? What was that? Who’s that? Why?!? The easiest description is that the script from Matt Cook simply takes on too much. The potential is obviously there. A movie about the crew itself would work, or the cops chasing them, or the Russian Mafia, or the cop set up to be murdered. You get the idea. There are about 85 different plates spinning at all times. At times, the story feels rushed, and other times too slow. Somewhere in between is a potentially great movie. Instead, it’s okay to slightly above average. An obvious positive is that cast. I’m sorry – THAT CAST. You’ve got at least 10 actors/actresses capable of carrying a movie on their own. The ensemble works well together, the talent on-display carrying ‘Triple’ through some of its flaws. Ejiofor is excellent as Atwood, the crook trying to stay in touch with his son and his estranged, ex-wife (Gal Gadot), who just happens to be sister to a Russian Mafiosa, played by Winslet. His counter, Affleck’s Chris, is underwritten in a character that should have been….I don’t know, more of something, either sympathetic or unlikable. The rest of the cast is fairly up and down. I would have loved more info on Mackie and Collins’ crooked cops. What makes them do this? Debt? Blackmail? Greed for more money? Give me something. Woody Harrelson gets a scenery-chewing part as Chris’ uncle, a beaten-up, weathered detective who’s seen it all. Reedus is underused, Paul is high-strung, and Winslet aims for the stars but in another underused part, doesn’t quite reach it. Also look for Michael Kenneth Williams (“The Gambler”) in a one-scene cameo he absolutely steals. What appealed to me most is the darkness, the dirtiness, the rampant corruption. There’s no one here you’re truly rooting for. Maybe Ejiofor’s crook. Maybe Affleck’s naïve cop. MAYBE. These are all pretty lousy people. You just know things will not end up pleasantly for a whole lot of folks by the end. It’s just a matter of who will make it. The music from Atticus Ross is excellent, almost like a silent partner moving the story along. It’s not loud or aggressive, just setting the scene for the doom that’s coming. With scores from “Book of Eli”, “Gone Girl”, “The Social Network” and “The Girl with the Dragon Tattoo”, Ross is fast-becoming one of my favorite composers. 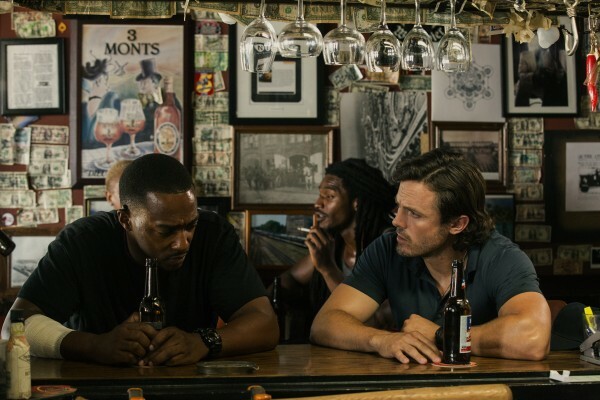 For a movie as dark as “Triple 9” is, you need a score as effective and unsettling as what we’ve got here. Other positives? 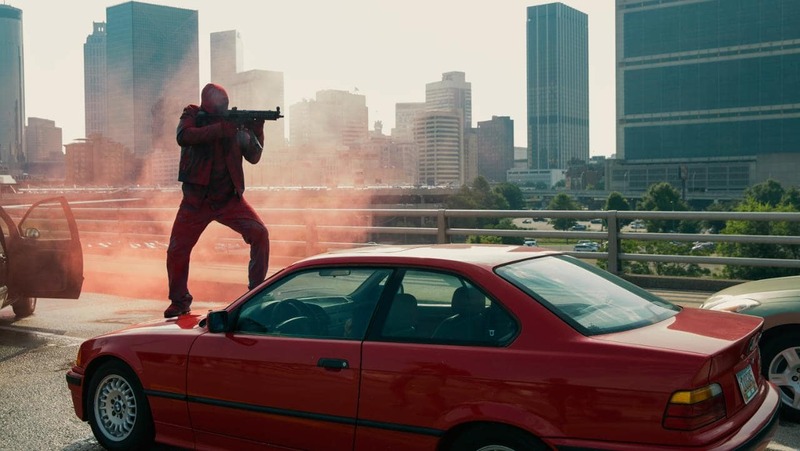 The opening robbery and its fallout jumps out, especially that iconic shot of the crooks jumping from their getaway car, all of them covered in red dye from the exploding dye packs. A tension-packed hunt through a housing project is intense, intense, INTENSE. The finale itself is disappointing as everything unravels. I imagined a different ending on basically all levels. It’s been a couple days since I watched the movie, and I’m still thinking about it, mostly because of its missed potential. Unfortunately, this is a movie missing that special something. A lot of good pieces, but they don’t always add up. Still worth a watch though with measured expectations.